Precip Coverage Expands to Whole of Brazilian Crop Belt: The EU & GFS models agree on an expansive pattern of rainfall impacting Brazil over the next 10 days. 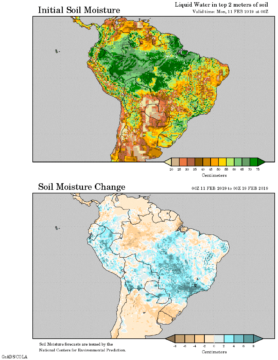 The projected change in soil moisture at left features net improvement across the entire Brazilian corn and soy producing areas. The moisture couldn’t come fast enough for newly planted safrinha corn with Feb 1-10 rain recorded at just 15-40% of normal across Mato Grosso, Mato Grosso do Sul and Parana. There’s no sign that a hot/dry high pressure Ridge returns to Brazil between now and Feb 25th. Precip accumulation will be widespread in Brazil this week and will range from 1.5-4.0”. Totals in the 6-10 day period are estimated at 1-3” across Mato Grosso, Goias and Minas Gerais. A close eye will be kept on precip and soil moisture in Southern Brazil throughout the next 6-8 weeks, but the worst of Brazil’s drought has passed. Lite rain and normal temps are offered for Argentina into early March. 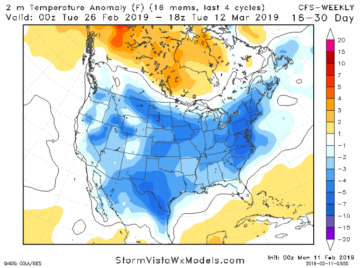 Severe Winter Conditions Persist in Central US: The Central US pattern will remain stuck into the end of February. Freezing lows will drift into Delta and Mid-South. Bitterly cold temps persist across the north. Blizzard-like weather will cause major transportation issues across the PNW. And 2-15” of snow impacts much of the Plains and Midwest over the next 5-7 days. The attached graphic shows the CFS model’s 16-30 day temp anomaly forecast. A later than normal spring is being eyed.